The Annatuinniniq Uqausittinik Conference was held in Kangiqsujuaq, Canada, from 16 to 18 April. Focused on Inuktitut (ike), the conference discussed the need for an action plan to save Inuktitut. There was also a youth panel discussion that revealed a generational gap, such as youth who want modern terminology and elders who have trouble understanding the English vocabulary and grammar that youth use when speaking Inuktitut. See “Nunavik conference seeks action plan to save Inuktitut” for more details and the Avataq Cultural Institute Facebook page for Inuit culture and language. The University of Melbourne has recently established the Research Unit for Indigenous Language (RUIL), the first of its kind in Australia. The focus of the RUIL is to understand the nature of indigenous languages in Australia and to address indigenous needs and language issues. They are incorporating a sociolinguistic approach. As part of the RUIL’s launch, they have scheduled a talk by Bruce Pascoe on 16 May. For the process involved in creating the “Our Land Our Language” report, see also “Tasmanian Aboriginal Centre testifying for palawa kani” and “AU government hears how children light up when learning Yawuru” on this blog. High schools in the US recently competed in a Latin competition that included grammar, geography, Greek derivatives and vocabulary. Although this year’s contest questions have not yet been posted, you can see the questions and answers from past years at the Texas State Junior Classical League website. For a list of many of the students and other details, see the article “Local students prove Latin is no dead language” in the Westlake Picayune. The Endangered Languages Project is gearing up for Endangered Languages Week from 20 to 28 May in London. The full program has yet to be released, but see some of the highlights at Celebrating our Sounds, Signs and Songs, including a debate on language endangerment by high school students. On 18 May, the Department of Culture and Media will hold its sixth annual Irish Language Day at Marylhurst University. Bob Burke, Marylhurst Irish instructor and vice-president of the North American Association for Celtic Language Teachers, will be at the language celebration. Read his blog entry on Irish at “Irish as an endangered language,” where he talks about a family receiving a stipend to raise their children in Irish and cites census statistics about Irish (gle) use in Ireland. Today, Lilla Balázs held a seminar on the protection of minority languages in the EU, with a specific focus on Romania. According to the Ethnologue, Romania has 22 living languages, of which five are institutional, 15 are developing, one is vigorous and one is endangered. The conference also featured a corner with Lushootseed (lut) materials for sale, some of which were given away in a raffle. Separately, attendees brought copies of the mammoth Klallam Dictionary and Sahaptin Dictionary (“First Klallam language dictionary revives ancient Native American tongue,” see also Klallam (clm); “Yakama Elder Keeps Her Native Language Alive“), incredible works of lexicography. Also found among the attendees was “Tiinmamí Tɨmnanáxt,” (Legends of the Sahaptin Speaking People), a collection of legends on CD each told in Sahaptin (yak) and English. 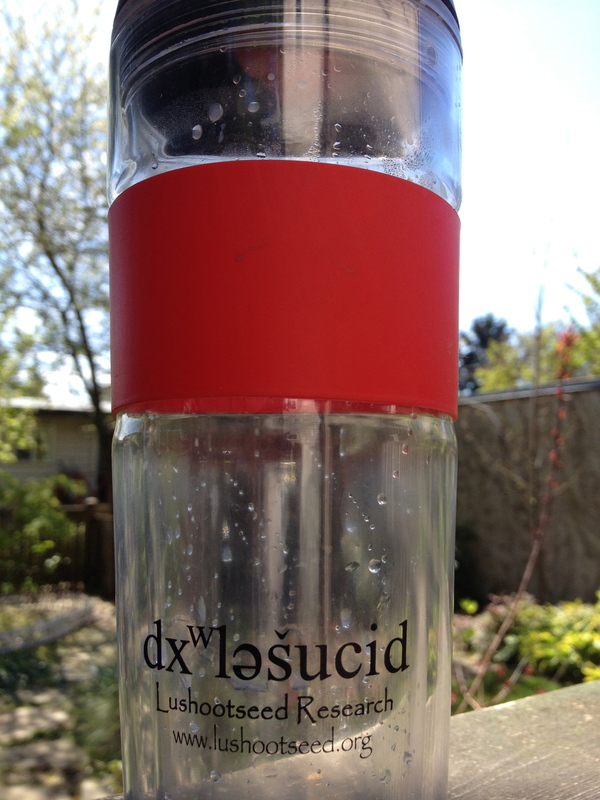 One other treat for conference-goers was a tumbler with “dxʷləšúcid” (Lushootseed) printed prominently in the proper Lushootseed letters, a must-have for coffee-loving Puget Sounders and other linguaphiles. As far as I know, this is a collector’s item only, unavailable anywhere, but perhaps you can convince Lushootseed Research to sell you one if any are left in stock! sbuusaɫ sqʷuʔalikʷ dxʷʔal ti dxʷləšucid, the Fourth Annual Lushootseed Language Conference, was held Saturday at Seattle University. Titled “šəqild čeɫ ti dxʷsdigʷid ʔi ti xʷdikʷ” (Honoring the Teachers and the Teachings), the conference had something for everyone: language, culture, community, revitalization, technology and more. Explain the importance of developing teaching materials. Lushootseed teachers Michelle Myles and Natosha Gobin discussed a literary technique used in Lushootseed storytelling along with a recounting of the history of the story “Lady Louse.” They gave out a wonderful booklet that includes photographs of Elizabeth “Lizzie” Krise, a DVD of “Lady Louse” and flash cards for teaching the story. John La Pointe discussed ties between Puget Salish culture and Christianity, weaving in his personal background. Zalmai ʔəswəli Zahir discussed how to create a space from which a language can be revitalized. Deryle Lonsdale discussed the online Lushootseed Dictionary project. It is expected to be available in a few months. Dave Sienko noted how despite tremendous processing power, smartphones lack full Unicode implementation and so have trouble with the Lushootseed alphabet. As a workaround, the Puyallup Tribe has released Texting Twulshootseed and other apps, which enables the iPhone to text in Lushootseed. Russell Hugo discussed Moodle, open-source software for educators, as one way to create a community of language learners. Lushootseed texts are available from Lushootseed Research. Although not currently listed, there are CDs also available.